Show Me And Tell Me Questions and answers! The new driving test has begun along with a new set of show me tell me questions. Previously, two show me tell me questions were asked prior to driving the car, the new test will still involve the examiner asking a ‘tell me’ questions at the start. The other ‘show me’ question will now be asked by the examiner whilst you are driving the car. This ‘show me’ question will be a basic safety task all of which are detailed below and will also be a suitable task that is carried out daily by all drivers. It is down to the test candidate to decide when it is safe to carry out the ‘show me’ safety task. The examiner will start the question with “When it is safe to do so”, therefore it’s not necessary that you carry out the task immediately. Consider first whether it is indeed safe to do so and if not, wait until it is. There are now 21 show me tell me questions in total; 7 show me questions and 14 tell me questions all of which are detailed below along with a printable version. You will not fail the driving test for either failing to answer the show me tell me questions, or for answering them incorrectly. You will only receive a minor fault, even if you get them both incorrect. You can amass a total of 15 minor faults in total during your test and still pass, so try to avoid getting stressed if you get one or even both questions wrong. Listed below are the 21 new show me tell me questions along with answers. Let’s start with the 14 ‘tell me’ questions, in which the examiner will ask one of these before going for a drive. Question. Tell me how you would check that the brakes are working before starting a journey. Answer. Just as you move off, operate the brakes. They should not feel spongy and the car should not pull to one side. Question. Tell me where you’d find the information for the recommended tyre pressures for this car and how tyre pressures should be checked. Answer. Information will be found using the car manufacturer’s guide/manual. Check the tyre pressures by using a reliable pressure gauge when the tyres are cold. Don’t forget the spare tyre and remember to refit the valve caps. Question. Tell me how you make sure your head restraint is correctly adjusted so it provides the best protection in the event of a crash. Answer. The head restraint should be adjusted so the centre part of the head restraint is at least as high as the eye or top of the ears, and as close to the back of the head as is comfortable. Note; some restraints might not be adjustable. Question. Tell me how you’d check the tyres to ensure that they have sufficient tread depth and that their general condition is safe to use on the road. Answer. A safe tyre will have no cuts or bulges on the sides. Legally, the tread depth must be at least 1.6mm across the central ¾ of the breadth of the tyre and around the entire outer circumference and can be measured using a tread depth gauge. Question. Tell me how you’d check that the headlights and tail lights are working. You don’t need to exit the vehicle. This is a ‘tell me’ question, so you do not need to physically check the lights. Answer. Explain to the examiner that you would turn on the lights switch, turn on the car ignition if necessary, then walk around the vehicle to check lights. Question. Tell me how you’d know if there was a problem with your anti-lock braking system. Answer. Warning light should illuminate on the dashboard if there is a fault with the anti-lock braking system. Question. Tell me how you’d check the direction indicators are working. This is a ‘tell me’ question, so you do not need to physically check the indicators. Explain to the examiner that you would activate the hazard warning lights and walk around the car to see if all the indicators are working correctly. (Note: Operating the hazard warning lights is the preferred method as the ignition will not need to be switched on). Question. Tell me how you’d check the brake lights are working on this car. This is a ‘tell me’ question, so you do not need to physically check the brake lights. Answer. Explain to the examiner that you’d operate the brake pedal, make use of reflections in windows or doors, or ask someone to help. Question. Tell me how you’d check the power-assisted steering is working before starting a journey. 1)Gentle pressure on the steering wheel, maintained whilst the engine is started, should result in slight but noticeable movement as the system begins to operate. 2) Turning the steering wheel just after moving off will give an immediate indication that the power assisted steering is functioning correctly. Steering should be very easy as the car begins to move off if all is working as it should. Question. Tell me how you’d switch on the rear fog light(s) and explain when you’d use it/them. (No need to exit vehicle). Answer. Operate switch (turn on dipped headlights and ignition if necessary). Check warning light is on. Explain that fog lights must only be used in foggy, low visibility conditions and must be turned off when fog disperses. Question. Tell me how you switch your headlight from dipped to main beam and explain how you’d know the main beam is on. Answer. Operate light switch (ignition may need to be switched on or engine started if necessary), activate main beam lights and check the blue main beam warning light is on. Question. Open the bonnet and tell me how you’d check that the engine has sufficient oil. Answer. Identify the dipstick, explain that you would remove the dipstick and wipe clean the end where the minimum and maximum level indicator is and fully reinsert. Remove once again and check the oil level against the minimum and maximum markings. If oil levels are low, top up with oil but be sure not to over-fill. Question. Open the bonnet and tell me how you’d check that the engine has sufficient engine coolant. Answer. Identify the engine coolant tank and check the minimum and maximum level indicator displayed on the side of the tank. Explain that if the coolant is below the minimum mark, more coolant (water) will need to be added. To do this, explain that you would unscrew the tank cap when the engine is cold and pour in coolant until the maximum mark is reached. Question. Open the bonnet and tell me how you’d check that you have a safe level of hydraulic brake fluid. Answer. Identify brake fluid reservoir, check level against high and low markings. Detailed here are the 7 new ‘show me’ questions. The examiner will ask you one of these whilst you are driving the car. The new Show Me Tell Me driving test questions are designed to show the examiner that you have a basic knowledge of your cars safety and legal requirements. Provided are some tips on understanding the Show Me Tell Me questions and answers. Show Me Tell Me answer 14 explains there should be a minimum of 1.6mm of tyre tread depth to remain safe and legal whilst driving. 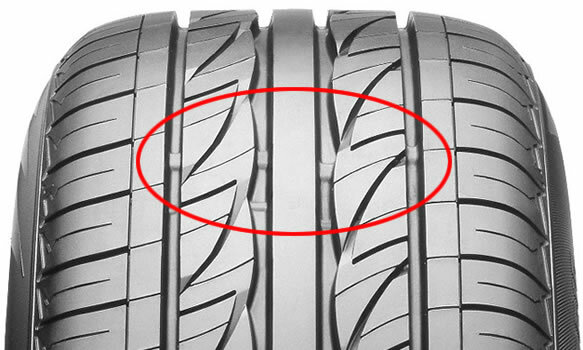 The picture above shows the tread depth has not yet reached the tyre wear indicators. Keep a check on the tyre wear indicators. If the tyre tread depth gets close to these indicators, it’s time for a tyre change. Show Me Tell Me answer 1 explains you should Identify the engine coolant tank and to check the minimum and maximum level indicator. Each make of car will have a different looking coolant tank but will look similar to the one above. Minimum and maximum level markers should be indicated on the tank. Allowing the coolant level to fall below the minimum for long periods can cause overheating and damage your car. Regular checks of engine oil level is essential. Show Me Tell Me answer is to locate the dipstick which will look very similar to the picture above. Check the minimum and maximum level indicators for your dipstick and not letting the engine oil fall too close the minimum. Allowing the oil to fall under the minimum level can result in engine damage. When putting more oil into the engine, pour in small amounts at a time whilst frequently checking the dipstick to ensure you do not overfill with oil. Checking your windscreen washer reservoir and keeping it full is important as suggested in Show Me Tell Me answer 5. It’s surprisingly easy to forget about this and the last thing you need is to be driving on a motorway with your windscreen getting increasingly muddy with no means to clean it.